Do you know that there is a new Thai Restaurant in Krystal Point? Well, it is actually a good news for the resident in Bayan Lepas area as you don't have to drive all the way down town. As I believed that this is the same restaurant in Abu Siti Lane, Penang. I never try the town one before but have the opportunity to try the one @ Krystal Point. It barely open for 2 weeks only. Jalan Sultan Azlan Shah Ahah, 11900 Bayan Lepas, Penang. After we were seated, we browsed through the menu. And hubby asked what would we like to have. Both my gal and I just asked hubby to order. So hubby order 5 dishes. Straight after the order, here come the appetiser. Raw cucumber and long beans with sambal. Guess what??? My gal is so adventurous and dip the sambal. Not once but many times. I like the sambal being served here. You will not feel the fiery hot taste straight away but after a while. The sambal spiciness still acceptable for me. As I am not very good in handle too spicy foods. Hubby decide to order tom yam to try. We order the small size of tom yam as usually I am the one have to finish it all. As they don't really eat too spicy foods. But out of surprise, this tom yam is rather sourish than spicy. So my gal have some of it. 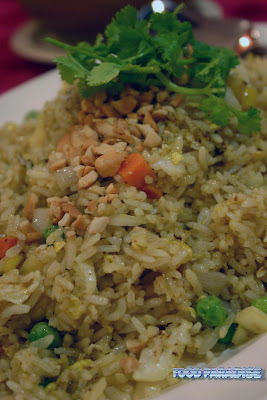 Hubby decided to have a change and go for pineapple fried rice instead of normal white rice. As recently my gal fond of pineapple fried rice. And we were discussing whether to get the small size or the medium size serve. And we were told by the waiter that we should go for Medium as the Small is for individual servings only. Hubby worried her baby gal cannot handle spicy foods. So order this for her. And it has a nice aroma. After browsing through the menu, both hubby and I saw this dish. Hubby asked if I want to try it out. Then I said yes as we been seeing lots of food programme introducing this dish but we never get to try it out. Since this is the opportunity, off course we would like to try it out. The coconut shoot is very crunchy and I even asked my gal to try it and she did but she told me it is too spicy for her. But hubby and I found that it is not spicy at all. For those who don't like basil, perhaps you have to omit this dish as it has lots of basil in there. I was so full after the dinner but hubby told me that he still can have dessert. So I asked him to order one will do. So this is the tab tim krob being served here. Overall, it is quite a nice dinner we had. As the foods are not too spicy. It is good for family that have kid that cannot take too spicy foods. For the location, please refer here. One thing that is nice about this place is to have nice breeze and scenery while you dine here. Most of you should know by now that the satay serves here is without satay sauce as it was coated in the satay. My gal sometime find that it is quite spicy for her. But normally she will take 2 pieces of satay and then she will clear all the cucumbers in no time. My friend enjoys the satay here and she loves it very much as she never tried this kind of satay before. Apart from the satay, we order some other dishes. And since my friend cannot take spicy foods, so we order all of the things non spicy for her. We were introduced by the lady who took our order for this home made tofu. And since we did not try before, so we order one to try. Overall, the tofu taste ok. The sotong is nice. As it is crunchy in the outer part that coated with the flour and inside is soft and tender. My brother and sister love the crab here very much. Especially my brother. Whenever I brought him to another shop to have the crab, he will compare and tell me that he still loves the way this shop prepare their crab. My friend is happy digging with the crab and told me that she loves the way they prepare the crab as she usually have crab that cooked with sauces. It is quite a good experience for her. At least she got the chance to sample some of the foods that she never tried before. By the time we finished our meal, it is around sunset. Took this photos before we left. By the time, we left, the place is so crowded with customers. So be there early if you want to savour the foods in this restaurant. Over the past one year since I start open my blog to the public, I came to know many people such as food blogger, FoOd PaRaDise readers, owner of the restaurant where I visited and do review. Then we keep in touch with each other from time to time. And today, I would like to introduce a place for "chu char" which I get to know him when I visited 西公园(See Kong Ooi). He is the chef there before. Then we keep in touch with each other through email. And I get to know that he is searching for new place to set up his own business. He is Hock Chai , the restaurant owner of Restoran Zi Zai which some of you might knew him. The shop just barely 3 months ++. 1239-G Ground Floor , Jalan Paya Terubong 11060 Air Itam. Penang. List of the foods being served in this restaurant. There are another list of foods too but I just managed to captured one of it. Before I went to the shop, I asked Hock Chai what is his favourites and he told me it's the belachan chicken. So I always kept in my mind that I shall try this as I did not order this dish back in See Kong Ooi. Hubby feel like having some curry for the night and so we ordered the assam curry fish. My gal like the assam curry sauce. As it is not too spicy. Hubby worried that my gal cannot take the assam curry fish, so he ordered the prawn omelette for her. Mind you the prawn is rather big and fresh. We love the aroma of the omelette when it is being serve in our table. After my first visit, I told Hock Chai about what we think of the foods and he told me that he will look into it and wrote to me again that he had introduce new dishes which I might like to try. So, hubby and I make a move there again after one month. As usual, no spicy greens for my gal, we order stir fry kang kong with garlic and it turns out to be very nice. My gal enjoys it very much. This is one of the dishes that Hock Chai asked me to try and it became quite popular dish since he introduce it in his new shop. The spare ribs is very tender and there are lots of mushrooms. It is quite a normal dish. For this dish, you can choose to have different kinds of fish and you can also have fish head too. But we order fish meat this time since it is easier for my gal. We love this dish very much and I would recommend that you try this out. It is very suitable for the elderly and the kids. Beside the deep fried fish meat, there are deep fried tofu, some greens, carrots and sprinkle with spring onion. 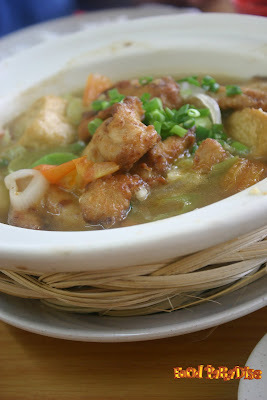 Recently, I received an email from Hock Chai that they have introduce another dish ~ Deep Fried Fish with Sambal Sauce. You can give it a try and let me know when you try it. 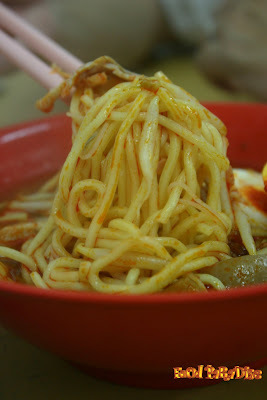 If you don't like chu char, then they also serves different kind fried rice and bee hoon. To avoid the long wait, I would suggest you to go early especially during weekends. I am sure this is the place where it is not a stranger to anybody in Penang. As this coffee shop serves nice and varieties foods. We tend to have difficulty to get a seat no matter whether you go during weekdays or weekend. It is usually full house. Normally we will go there during breakfast in the weekend but during one weekday whereby hubby taking day off, we decide to go there and check out whether there are as many patrons as always. Hubby opts for the stir fry version of mee jawa. 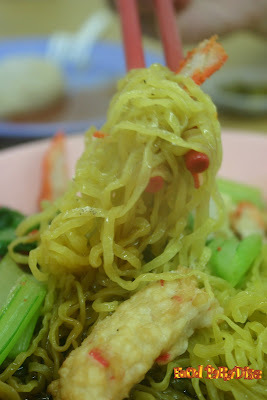 And we found out that the way the stall owner add in the egg into the mee jawa is something different. Every piece of the noodles is cover with egg. Hubby comments that the noodles are not bad. Hubby cannot wait any longer and bought some chai kuih and kuih from the kuih stall. The chai koay being serves there are not too bad. The skin and fillings of the chai koay are ok. I am not really a fans of nyonya kuih. But I do take it from time to time. I am not sure when, I started to dislike the kuih that coat with coconut. But hubby insist me to try and told me that it tastes nice. As an adventure person, I will always try my best to try. Overall, not too bad. Both of us share this hokkien mee. And this bowl of hokkien mee is quite nice. Have a nice aroma. This is actually my order of koay chap. I like to try different stall of koay chap. Each stall has it own aroma and flavour. And the textures of the koay chap varies too. Overall, I found that the koay chap here are not bad. If you don't like the coriander, then you have to ask the stall owner not to put as it will immersed into the koay chap soup base. My previous post about the pancake can be view here.